She knows your darkest secrets and your favorite OPI nail polish color. Where would you be without your best friend? I know I'd be lost without mine- who would laugh at my bad Australian accent impression and bring me gummy bears when I'm sick? I saw the Hot Guys and Baby Animals book at Urban Outfitters this weekend, and couldn't resist getting a copy for my blogging bestie Lindsay (of Sadie+Stella fame). Hope you enjoy! Happy Monday! Ha ha Love that calender!! Great list here...those earrings are to die for! I have a giveaway on my blog for my 2nd blog anniversary! Stop by and check it out! I saw your shot of this book come over Instagram yesterday and had a good laugh. I mean, what girl wouldn't love that book? Great line up. The Besos notecards are my fave of this group. I might have to pick up a set for myself! Ever since I saw pictures from the Kate Spade show at FW I have been waiting for that tequlia bag to come out...it is screaming emily this is your life haha! Yesss that calendar is amazing! I love that Kate Spade pouch. I know a few of my friends that would love it!! Great roundup!! 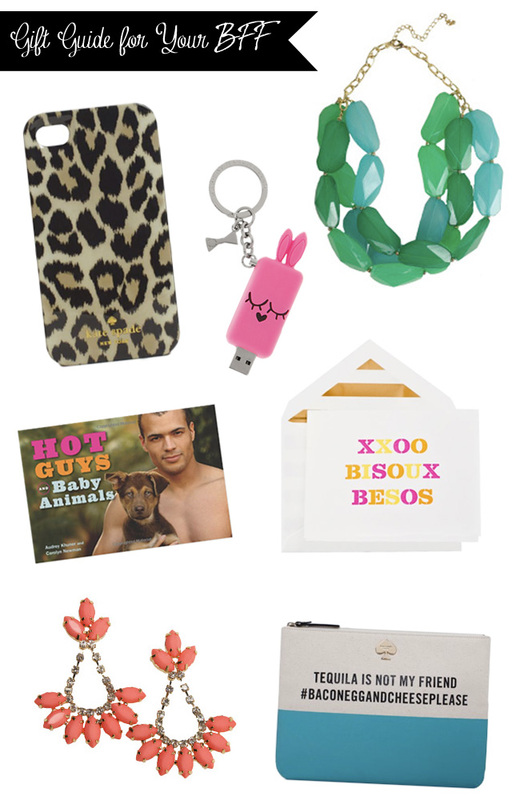 Oh how I love a good gift guide!!! And *pinch me*...I had no idea that Furbish starting carrying all that fabulous jewelry! WHERE HAVE I BEEN?!? OMG I have to get that pouch for my friend! I bought the kate spade tequila pouch the day it was released! It screams whataburger-late-night-run. These are some great gifting ideas! I love the kate spade tequila is not my friend pouch! and that calendar is hilarious!! Love this series! That necklace is amazing and I've been coveting that Kate Spade pouch ever since it came out! Sooo funny and perfect bestie gift! I love the KS pouch!! Too funny!! and the earrings are adorable! Great gift ideas and great price points! Thanks. That Kate Spade pouch is too funny! I'm loving that these gifts cover tons of price points! I'm obsessed with the Kate Spade pouch! I love you Sam!! You are my bestie! I have this necklace too. Great minds think alike! LOVE all of your picks! Doesn't Kate Spade have the cutest gifts right now?! I'm starting my gift guide series on Wednesday as well! GREAT picks! I actually just bought that iPhone case yesterday, cannot freaking wait for it to come in. Excited to see more of your gift guides!